I think one of my greatest pleasures is to sit with a glass of wine and a wonderful cookbook and read and plan. I've been thinking that sharing some of my favorites, might be fun. I honestly have far too many, but that is my weakness. 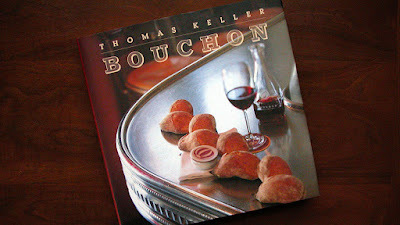 Today's cookbook is Bouchon. It's a wonderful collection of French bistro recipes complied by Thomas Keller, who is arguably the finest chef in America. He is a purist. Uncompromising and a bit prickly, but his cooking is sublime. He apprenticed in Paris and learned the recipes in country. I've had the great pleasure of dining in his flagship in Napa called The French Laundry, on two occasions and also I have enjoyed Bouchon on one occasion. It is always a wonderful experience. If you want a cookbook which gives you a truly authentic overview of bistro food, then this is it. Bon appetite and bon chance.